Before I start, I just wanted to say that I got the pick right (I’m the man). On a serious note, the Hawks couldn’t have went wrong with the Collins pick. Entering Thursday’s Draft, the Hawks faced a lack of depth at the Power Forward position. Also, with the possibility of All-Star Forward Paul Millsap leaving in Free Agency, it was a forgone conclusion the Hawks would add depth in the frontcourt. Collins brings much length and size to the Hawks, a team that we’ve seen struggle to draft impact players at Power Forward . From his rebounding skills are excellent to the offensive game around the paint, he’s great to watch. Although the offensive impact outside of the paint will need improvement during his NBA career, Collins came to the perfect location since Coach Bud’s scheme and coaching staff has developed players over the last few years. I have high expectations for Collins, I think he’ll be special for this team in the future. I think the Tyler Dorsey pick was my favorite from the draft. This man is a professional bucket-getter, if you need proof, look at his performance during March Madness. With the future of Tim Hardaway Jr. still in the air, Dorsey provides an outside shooting option at the Shooting Guard position. My concerns with Dorsey is being a liability on defense at the next level. If he could manage to get bigger and commit to the system, he could be a great player for Atlanta. 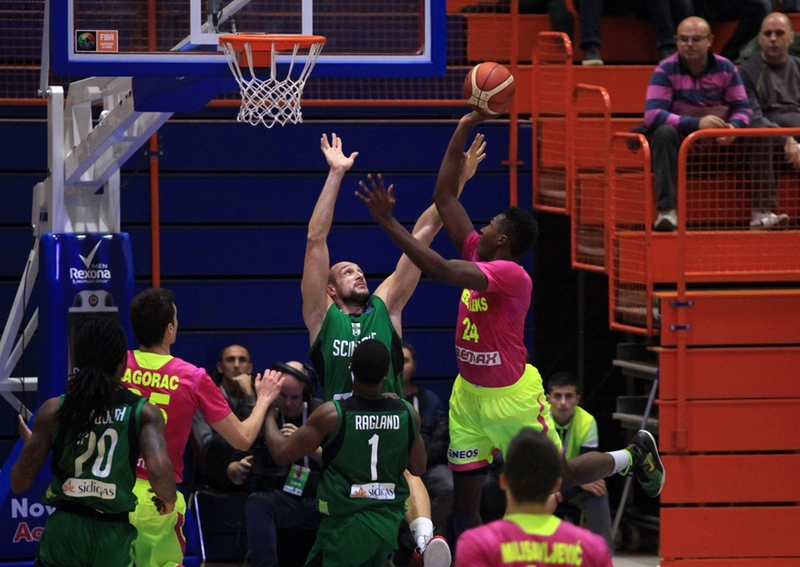 The Hawks decided to add more depth in the frontcourt at 60, as the saying goes ” the more size, the better” with the selection of Alpha Kaba, and that’s not a problem. Kaba has similarities to former Atlanta Hawks center Edy Tavares due to his wingspan, but we all know Edy failed to make an impact in his Hawks tenure. Overall, I see Kaba more as a draft and stash type of guy, so we’ll just have to see how the Hawks plan to use him in the future. With the Hawks more than likely losing Paul Millsap and Tim Hardaway Jr. to Free Agency, it was imperative for their strategy in the NBA Draft to solely focus on adding depth and younger talent to the fold of a potential rebuild. John Collins was a great addition to the Hawks at 19th overall. Collins gives the Hawks a younger option at Power Forward with a high ceiling. He is a high motor player that can score on a lot of hustle plays, and he also is a good low post scorer that possesses a great shooting touch around the basket. One of my favorite attributes with the Collins addition is the ability to attack the paint and run the Pick and Roll offense, one of Coach Bud’s favorite plays. One of his concerns is playing with control in a offensive scheme because he’s erratic at times and coming to a Hawks roster solely based on ball movement, Collins must develop into an effective passer. Overall, I’m excited for the future with the young prospect. 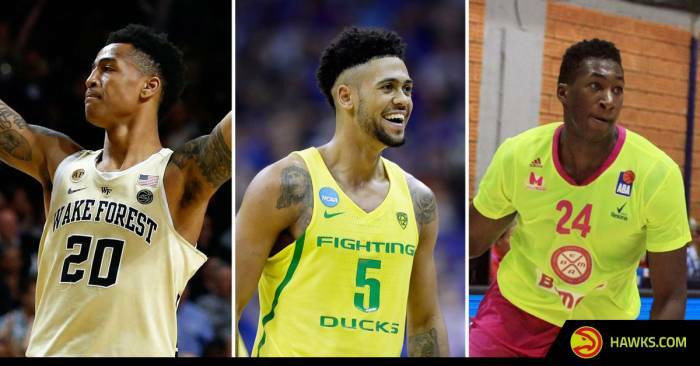 At 41, the Hawks selected Tyler Dorsey, “Mr. March!!”. Dorsey was arguably one of the best players in the NCAA Tournament as he helped the Oregon Ducks make the Final Four for the first time since 1939. Dorsey actually slipped from his original late first-round projections! Dorsey has very good scoring skills. He is a speedy, aggressive scorer that has a solid first step, as he can get plenty of scores off the dribble and in transition. The kid is a shooter, which the Hawks desperately need! Also, he’s a solid rebounder, which is impressive for a kid his size. Dorsey’s biggest concerns is limiting turnovers and becoming a defensive liability. He’s not an aggressive defender; however, when the player buckles down, he can earn stops, steals, and rebounds but the Hawks will need him to make a bigger impact on a team well known for defense. Also, Dorsey can create his own shots but he can’t solely focus on just offense or that could cost the Hawks a few wins. At 60th, Alpha Kaba is simply a draft and stash guy so I expect to see him possibly join the Hawks in a few years. For the picks the Hawks had, Atlanta did a very solid job with drafting perhaps the best available player in the first round in John Collins, a team need with the selection of Tyler Dorsey at 41, and a stash-and-draft selection with the final pick of the night. However, “solid” just isn’t good enough anymore quite frankly. Last week’s Dwight Howard trade and new General Manger Travis Schlenk’s comments about Paul Millsap’s free agency status are all signs pointing to the franchise starting fresh. With a point guard that isn’t below average, but isn’t elite either as your best player, the Hawks now go from a team that was above average to average. For draft night to end with new key role players on a good team added on to squad literally full of players that fit that same description appears as another lateral year and draft for a team whose progress has been lateral for a decade now. With the 19th Pick in the 2017 NBA Draft, the Atlanta Hawks selected John Collins out of Wake Forest. John Collins is a 6’9 Power Forward with a lot of promise. Collins is a considered a true power forward or a “True 4” among experts. He can post up, has a nice mid range jump shot and is very athletic. If the Hawks are in a rebuilding mode, John Collins is a decent start. He could possibly be the future starting power forward really soon. I give the Collins selection a B+. With the 41st pick in 2017 NBA Draft, the Atlanta Hawks selected Tyler Dorsey out of Oregon. Tyler Dorsey is a excellent scorer! He can shoot, get to the rim and create his own shot. He’s 6’4 so it’s possible that he could be a combo guard as well. If the Hawks do decide to rebuild, this is another great young option to develop in Mike Budenholzer’s offense. At 60th, the Hawks selected Alpha Kaba. Many consider the final draft pick as a “draft and stash”. Kaba has a tremendous wingspan and his game offensively is still a major work in progress. His lack of progress as a scorer, shot-blocker and in terms of his feel for the game the last few years is a concern, but he will still be a viable option for the Hawks if he can catch up with the current NBA. The Hawks’ selection of Wake Forest power forward John Collins is a solid pick. Collins has room to grow and with Paul Millsap (hopefully) not resigning with the team, the Hawks filled a large hole.Collins appears to have the ability to score like Millsap and for the Hawks it’s just what the doctor ordered. Unfortunately, I hated the pick. It was a typical Hawks’ pick that has left the team with a roster of role players. Collins falls in that category as a solid role player. He doesn’t scream future star, which is not expected with the 19th pick in the NBA, but with a player like Harry Giles on the board, it makes a ‘safe’ selection sting a little. Knee issues make Giles a risk, but the talent and upside is much higher than what Collins has. To find their star of the future, the Hawks will have to gamble (as the Atlanta Falcons have done recently), something our front office has avoided for years. Toughness is a skill that translates to any level in any sport and Dorsey appears to be both mentally tough and physically tough. He just has guts. No coach can teach guts and the ability to show up when the lights get bright. He will need to become a better defender and work on his shot, but Dorsey will be a man that sticks in the league and play multiple years and could have a career comparable to Courtney Lee or Matt Barnes. As mentioned above, I consider the Kaba selection as a “draft and stash” situation. Kaba may never wear a Hawks uniform. Kaba is much of an unknown to me and most of those who follow Hawks’ basketball. His name has drawn more reaction than his game, but maybe there is some potential there, it could be four years before the Hawks fans see just who the big man with the fraternity name is. At the very least, this pick adds more depth to an increasingly young front-court. Overall, the Hawks had a solid draft considering the talent remaining with the picks available to them. Collins was a player that should have been gone by the time the Hawks were on the clock.At the very least, he’s a solid starter or rotational player. In the second round, the Hawks picked up rotational ace in Dorsey and more front-court depth in Kaba. With the 19th pick, the Hawks selected John Collins from Wake Forest. Personally, I am pleased with the selection considering our main target was in the Front Court due to Dwight Howard’s trade to Charlotte and possibly losing All-Star Power Forward, Paul Millsap. John Collins is a very athletic 6’10 PF who moves well without the ball and off the dribble. Collins isn’t the best outside shooter but has the ability to knock down mid-range shots at an average rate. After watching film on the newest Hawk, his jump shot isn’t bad; however, the shot selection is a low range once which could encounter problems in the NBA. I’m fully confident that our coaching staff will develop his game as a NBA big man so Hawks fans, join in the excitement of watching Collins! The moment Tyler Dorsey’s name was announced, I was ecstatic due to his talent and potential to make an impact especially for an Atlanta Hawks roster desperate for offense. Last season, the Hawks struggled from behind the arc Dorsey provides an immediate upgrade in the shooting department. Dorsey excels as spot up jump shooting threat and create his own shot off the dribble, which is a key element previous Hawks teams missed. I don’t think Tyler Dorsey makes an immediate impact as a rookie and the Hawks could possibly send him to the D-League to further develop his game considering the future of Kent Bazemore and Tim Hardaway Jr. However, Dorsey will compete and could possibly earn a spot in the Hawks rotation. With our last pick, Alpha Kaba was selected. I don’t know a lot about Alpha Kaba but I believe that late in the draft, you can’t go wrong with drafting a big man because you never know how they will pan out. Sometimes, you could find a role player late in the NBA Draft. In conclusion, the Hawks should be proud of themselves and our rookies should make an impact in the future. Our Summer League games will be intiguing when we face off against some of the other young and rising players around the NBA. With the anticipated departure of Hawks All-star Paul Millsap via free-agency in the upcoming weeks, the Hawks decided to look towards the future. At #19 in the NBA Draft , Atlanta took Wake Forest Power Forward, John Collins. The sophomore out of Winston-Salem averaged (19) Points Per Game as well as (9.1) Rebounds Per Game to lead the Demon Deacons. Collins developed into one of the best offensive players in the NCAA, as well as garnering awards such as the ACC’s Most Improved Player. Collins is very versatile on the offensive side of the ball excelling at the pick and roll as well as being a premier cutter. He’s also been touted as a high energy guy who loves to play the game. Adding a reliable jumper to his game during his first season in Atlanta could go a long way in his development as a future starter here in Atlanta. A few areas of concern that prolonged his wait to hear his name called Thursday was is lack of a wingspan (6’11) relative to his height (6’10). Something that could hinder him during his career against longer players. The most glaring weakness of Collins was his defense. Collins looked utterly lost and hopeless on many defensive possessions leading to basket after basket last season. If he plans to stay in this NBA or avoid being a bench warmer, he’ll have to develop in Coach Bud’s scheme. If there’s anywhere Collins can progress, it’s in Atlanta. In one of the most underrated pickups Thursday night, the Hawks took Oregon guard, Tyler Dorsey at #41. At Oregon, Dorsey was surrounded by talented players his tenure, but during the NCAA Tournament, Dorsey shined and lead the Ducks to the Final Four last season. Dorsey averaged (14) Points Per Game and shot (50%) from the field and over (40%) from the three point-line. Dorsey was always a talented offensive weapon showing his NBA range nightly during his time in Eugene. He elevated his name even more during the PAC-12 Tournament as well as NCAA Tourney, by stringing together 8 consecutive 20 point games. I feel his Three-point game will translate to the NBA game, because of his quick shot release as well as his premier catch and shoot abilities. I don’t think of Dorsey just as a shooter, I consider him a scorer who can get his buckets at any point on the court. In order to succeed in Atlanta, Dorsey have to develop his skills as a passer. Last season at Oregon, he averaged (2) assists per contest this season. Playing in a system similar to Mike Budenholzer, I am confident he will succeed in Atlanta. Defensively, he struggles due to the lack of a wing span, and at 6’4, he’s average compared to most shooting guards in the NBA. ALPHA KABA: Best name in this year’s NBA draft goes to Kaba for sure. At 6’10 225, he definitely has the body to at least get a chance at this level. From reports, Kaba didn’t really develop in France and that was a big disappointment. At this stage in his career, he’s light years better as a defender than anything else his game presents. Atlanta fans you won’t see him this year as he’ll be a draft and stash type prospect. I don’t foresee ever seeing him in a Hawks uniform.